“Be relentless; never give up.” That’s what NEA Executive Committee member Earl Wiman told participants this week at the WEAC Summer Leadership Academy, where dozens of members gathered for inspiration and guidance in supporting public education and children. “Push farther and do more than you’ve ever done before,” Wiman said in a keynote presentation that included extensive audience participation. It’s important, he said, that every child in America has access to a great public school, no matter their zip code. And union members – especially the leaders attending this conference – are going to continue to play a key role in making sure that happens. The 2017 WEAC Summer Leadership Academy, at the University of Wisconsin-Eau Claire, also included a parallel JumpStart training session for National Board Certification candidates. A new NEA video pays tribute to Wisconsin Senator Tammy Baldwin, winner of this year’s Mary Hatwood Futrell Award at the annual NEA Convention. “There is no greater champion of women’s rights, worker rights and the middle class,” it says. At the end of the tribute video, WEAC President Ron Martin accepts the award on Baldwin’s behalf because she could not attend the ceremony because of her duties in the U.S. Senate. Baldwin was nominated for the award by the WEAC Human and Civil Rights Committee. Watch the video below and click here to read more about Tammy Baldwin’s Human and Civil Rights Award. Sequanna Taylor with WEAC President Ron Martin at the NEA Convention. Sequanna is a longtime activist and advocate for public education and specifically for the children in Milwaukee Public Schools. She also serves on the Milwaukee County Board. A Milwaukee native, she attended South Division High School and has an associate’s degree in criminal justice and bachelor’s degree in human services. She is also a graduate of an eight-month leadership-training program sponsored by Emerge Wisconsin, a national organization active in 14 states that prepares women to run for political office. She also is an active WEAC ESP leader and, nationally, Sequanna networks with ESPs at NEA ESP conferences. NEA’s Annual Meeting takes place during the final week of June and/or the first week of July. Various committees, constituencies, caucuses, leadership groups, and delegates from state and local affiliates gather to set policy and chart the direction of NEA business. Approximately 8,000 delegates – including 122 from Wisconsin – will represent state and local affiliates, student members, retired members, and other segments of the united education profession at the NEA’s Annual Meeting and Representative Assembly this summer in Boston. This year’s events take place from June 25 to July 5. Various committees, constituencies, caucuses, leadership groups, and delegates from state and local affiliates gather to set policy and chart the direction of NEA business. But the RA is about more than setting association policy. It’s also a venue for members and leaders to share information and insights, discuss leadership strategies, and form lasting friendships. “The NEA RA is a great opportunity to be a voice for and with WEAC at the National Level. It is also a way to be engaged in the NEA and get a stronger understanding for what the NEA does for EVERY state. 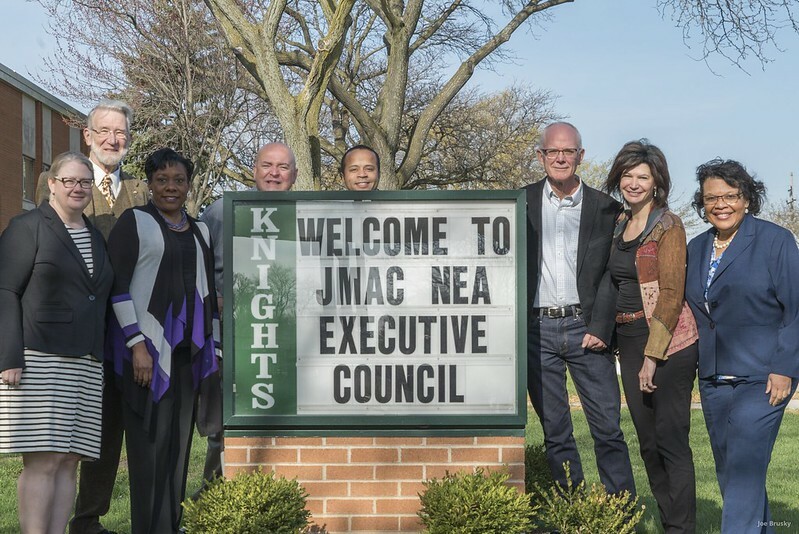 WEAC has received a grant from the National Education Association’s Great Public Schools (GPS) Fund to build respect and recognition of Education Support Professionals. GPS Fund Grants, established by NEA members in 2013, are designed to help enhance the education profession and promote student success. WEAC was one of 22 recipients. “Educators around the country reach, teach, and inspire students every day to learn and achieve their dreams, and to support their work we need to continue to accelerate the transformation of public education — these grants help with this process,” said Pringle. “Congress can start that process by renewing its commitment to the American vision of public education — one which welcomes and includes students of all backgrounds, identities, origins and abilities. We offer this keeping in mind the bipartisanship our nation saw during the reauthorization of the Elementary and Secondary Education Act, which produced the Every Student Succeeds Act (ESSA). In passing ESSA, Congress acted with the best interests of all students in mind — and now it should allow states and local communities the room to effectively implement it and avoid slashing or diverting the resources that help make that possible.